Happy national s'mores day everyone! 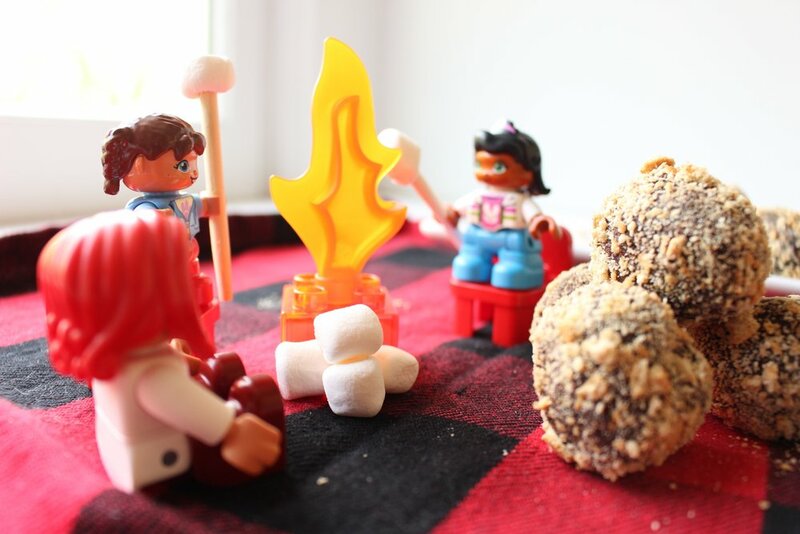 While I love a real s'more, I don't dig activities that include both my toddler and fire, so we're sticking with this faux, somewhat healthier version. Also, these energy balls can be packed in a lunchbox (after subbing the nuts for pumpkin or sunflower seeds if necessary). 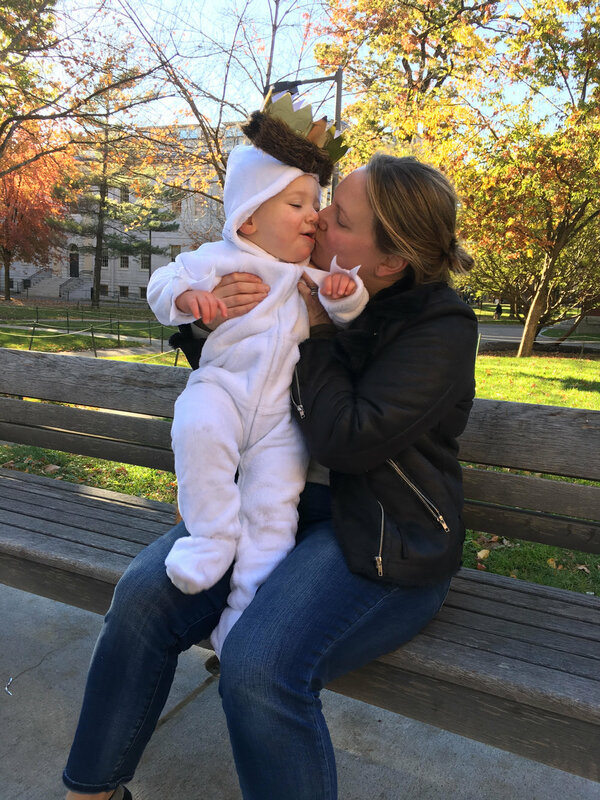 Your kids' teachers and counselors will thank you for skipping the sticky marshmallows and melted chocolate. These balls start as your basic date, cocoa powder, nut, and chia seed energy ball. And if s'mores aren't your thing, you can absolutely stick with this base and have a delicious treat. One note about the toasted marshmallows: Since they're so small, toasting them makes them a bit crunchy. You can absolutely use untoasted marshmallows to have that soft texture in the center, but to me, the taste of slightly burned sugar is more s'more-like. I also like a little bit of crunch in the middle of a soft energy ball anyway. A note about the graham cracker coating: If you can, store the crushed graham crackers in an air-tight container and roll the balls right before eating. Otherwise, the crumbs can get soft. Pit the dates and place them in a large food processor. Add the cashews (or seeds, if using), cocoa powder, chia seeds, and 2 teaspoons of water. Blend until the mixture starts to form a large ball, about 3-4 minutes. If your mixture won't come together in a large ball with the machine running, add the final teaspoon and blend until you have a large ball. On a parchment-lined baking sheet, place your mini marshmallows so that none are touching. Toast them in an oven or toasted oven heated to 400 for about 1-2 minutes. The regular oven will toast the marshmallows very quickly, so watch them like a hawk. You can even leave the door open slightly to make sure that the marshmallows don’t burn too quickly. The toaster oven is somewhat easier to control, but you still have to watch the marshmallows very closely. Place the graham crackers into a large bag and crush them with your hands, a rolling pin, or a heavy can. To make the balls, measure out a slightly heaping tablespoon of the date and chocolate mixture. 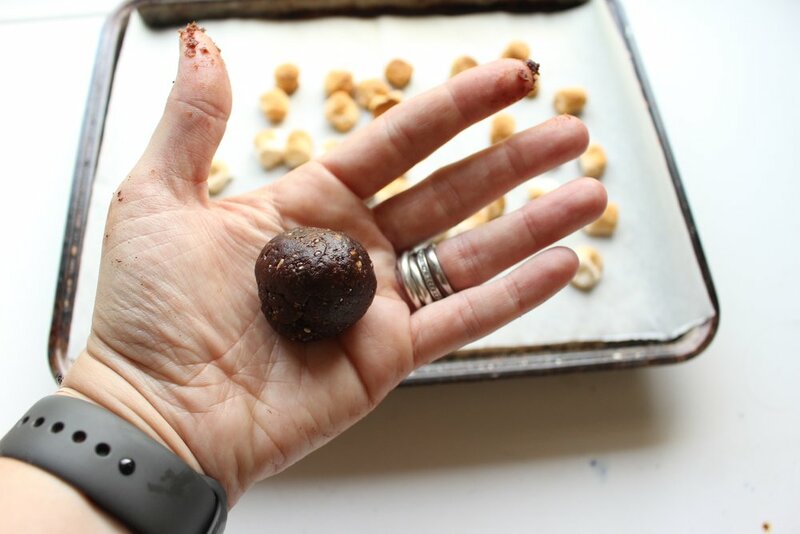 With wet hands, roll the mixture into a ball. Make a large hole in the center and add three toasted marshmallows. 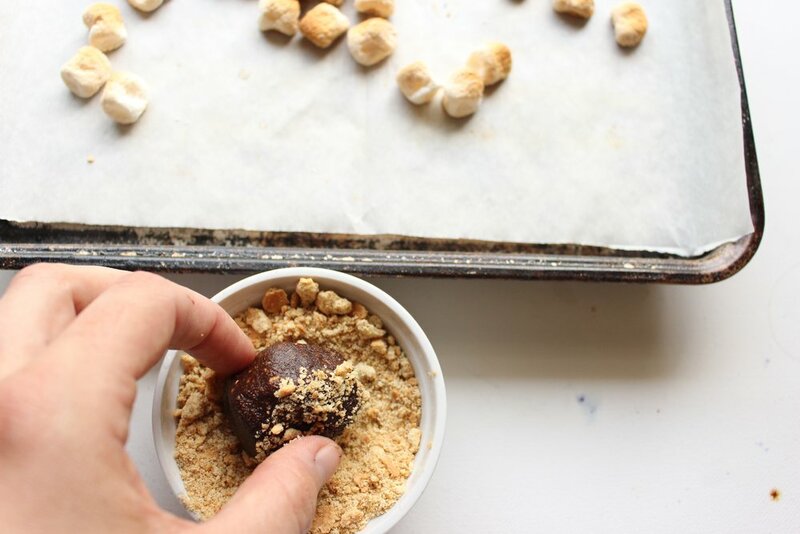 Fold the mixture over the marshmallows and roll into a ball again. Roll each ball in the crushed graham crackers.